December | 2012 | Beer Apprentice - Craft Beer News, Reviews, Interviews and Info. Hello everyone. 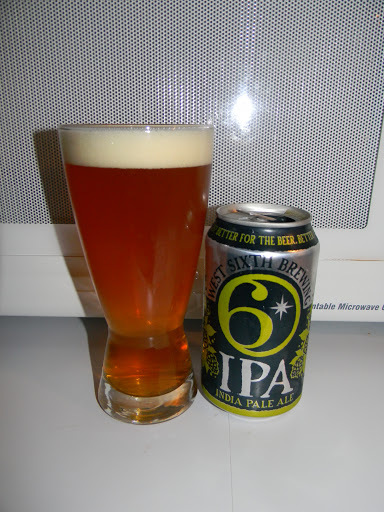 For today’s craft beer review I’m going to be trying the West Sixth IPA produced by the West Sixth Brewing Company located in Lexington, Kentucky. I’m always excited about trying a beer from my home state and I’ve heard some positive things about this particular beer, so I’m hoping for the best. The website, westsixth.com, did not have a commercial description regarding this beer, but they did have a nice little description about the development of the brewery itself. West Sixth Brewing founders Ben, Brady, Joe, and Robin all came to the same conclusion at about the same time – Lexington, KY needs more high quality local craft beer. Since we came from very different backgrounds with diverse sets of experiences and talents, we joined forces to create beer that can be enjoyed not only by craft beer experts, but also by those who just want something tasty to drink after going for a bike ride. Though we all got to this point in our lives in different ways, we strongly agree on West Sixth’s goals. We will provide a taproom and beer garden where the beer list is never the same but that is always local. We will be a brewery that measures its success not only by making great craft beer but also by how it helps our community. We will always strive to protect our environment even if it costs us more to do so. And last, but not least, we all share a desire to create the best beer possible and to be an integral part of building a great beer culture for our great town. This beer came in a 12 oz. can and it had an ABV of around 7.0%. It poured a somewhat hazy, amber/orange color with some burnt yellow highlights at the bottom of the glass. The crown was sized well, slightly off white, smooth, creamy and soft. The retention time was commendable and the lacing left behind was admirable. The nose fell right in line with what a solid IPA should smell like. Hints of grapefruit and orange citrus as well as a solid dose of pine and floral notes. It also had a subtle sweetness that I liked. Once it settled a sturdy bouquet of a light bready and biscuity malt helped balance things a bit. Overall, I thought this beer had a very nice fragrance from start to finish. The taste was similar to the aroma, however just a tad bit more restrained. It wasn’t quite a bright or vibrant yet, it still provided noteworthy tones of fresh and juicy grapefruit and orange citrus. It released more pine and even a bit of resin. It had an excellent bitterness and hop profile. The bread and biscuit backbone held things together nicely for the entirety of the drink. Quite flavorful and nice. The mouthfeel was medium bodied. Smooth, crisp, dry and refreshing. The carbonation was of medium strength and an exceptional amount of flavor was left behind after each sip. Well, I thought this beer was pretty dang good. It’s nothing overly complicated nor does it really try to be anything it’s not. However, it’s a very well made brew that’s true to the style. One that I wouldn’t mind having in my fridge at all times. It has a great drinkability and it has enough hop “kick” to satisfy most any hophead. I’m really excited about the West Sixth Brewing Company because it’s a Kentucky brewery that we can really promote and be proud of. Although, at the present time, it’s my understanding that the West Sixth IPA is the only beer being shipped for consumption. One must visit the brewery to sample some of their other products. Oh well, until they package a few more things I’ll just continue to enjoy this nice beverage. Hello everyone. 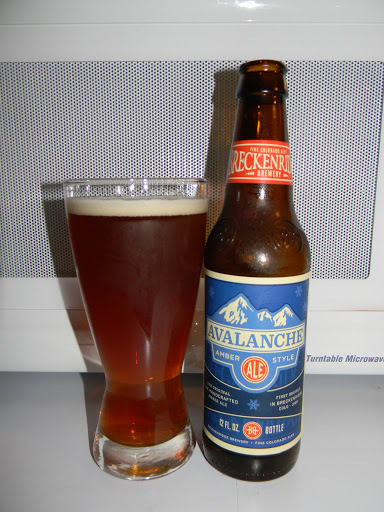 For today’s craft beer review I’m going to be trying the Avalanche Amber produced by the Breckenridge Brewery located in Denver, Colorado. The Breckenridge Brewery really needs no introduction. They have long been associated with the craft beer movement, so let’s just go ahead and get to the website, breckbrew.com, and see what they have to say about the Avalanche Amber. That’s what makes our Avalanche amber ale such a treat. We blend pale and caramel malts — and just a kiss of bittering hops — to create a refreshing-but-flavorful, anytime beer. Aromas of pale grains, a semi-sweet middle and a clean-as-Colorado snow finish make this our best-selling beer. It’s been some time since I last had this brew, so let’s get it poured shall we? This brew came in a 12 oz. bottle and it had an ABV of 4.4%. It poured a nice amber color with some burnt orange highlights around the edges. It had a very nice clarity too. The crown was off white, kind of small, sort of creamy and smooth. The retention time wasn’t all that spectacular and the lacing was a little bit sparse. The aroma presented some sweet caramel and toffee malt along with some toasted grains and hints of wheat bread. It had a decent little earthy fragrance that established a “round” and soft profile. The bouquet seemed to be balanced well enough and, overall, not bad at all. The flavor discharged more of the caramel and toffee malt, however the toasted grain aspect nudged its way to the forefront and quickly became the heightened factor. It developed a slight mineral component as well, which was paralleled by a doughy biscuit type of savor. Nary any bitterness was to be found. The mouthfeel was medium bodied. Smooth, not quite dry, yet mostly crisp. A good, medium strength carbonation was to be had, however not a lot of flavor was left behind after each sip. Well, this beer wasn’t bad. I found it to be a brew that could be a great introductory beer for someone just getting their feet wet when it comes to craft beer. It had a killer drinkability and with the somewhat lower ABV I believe that a person could have several of these and be quite content without getting too overwhelmed with flavor. It has a bit of complexity for some discussion and it would be totally fine for the Fall season, however the Breckenridge Avalanche Amber is not necessarily a “world-class” beer in my opinion. Just to be clear, it’s nowhere near horrible and it’s absolutely worth a try if you have yet to do so because I think it could make for a great time with friends when just wanting to drink a no frills, easy going beer. Hello guys and gals. How is everyone doing? I hope well. Thanks for checking back in on another craft beer review. For today’s tasting I’m going to be trying a 2008 Boon Oude Geuze Mariage Parfait produced by Brouwerij Boon located in Lembeek, Belgium. I’ve had a couple of other Boon products before and have been somewhat unimpressed, but I’ve heard great things about this brew, so I’m hoping for the best. The website, boon.be, had this nice, lengthy commercial description. Very cool. Let’s try it. This beer came in a 12.7 oz. bottle and it had an ABV of 8.0%. It poured a hazy/cloudy, orange color with a white, soapy, somewhat fizzy head. It was sized nicely and maintained some solid retention time considering the texture. The lacing was sturdy too and I could see a steady stream of bubbles rising to the top along the sides of the snifter. The aroma presented a wonderfully tart and sour profile. Some sour green apple as well as some green grapes. It was slightly acidic and vinegary with a musty undertone. Hints of wood and oak as well as a very prominent yeast component. All in all, very funky, complex and very good. The flavor released an explosion of sourness at first, however it totally relaxed after the first few sips. It was sour, tart and funky. More soured fruits of green apple and green grape. Some musty, wet hay and yeast came through along with a defined oak and earthiness as it opened up. Very nice. The mouthfeel was medium bodied. Sharp, bitey, crisp and very dry. The carbonation was very good for a beer with this kind of age on it. A small amount of warmth was felt at the back end and the palate was completely drenched with flavor to create a very long finish. I thought this was a great and beautiful beer. Truly a Sour beer to be tried by Sour fans. It was complex and chocked full of character. I thoroughly enjoyed drinking it and the overall drinkablilty was quite good as well. I don’t necessarily think that this would be a brew that I would want to drink everyday, however I could definitely see myself craving it more often than not. 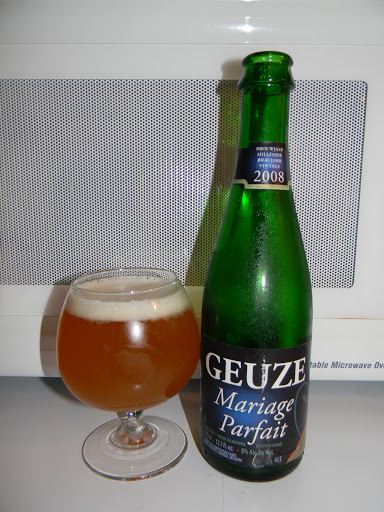 Have you guys ever tried a Boon Oude Geuze Mariage Parfait? If so, what vintage did you try? Did you like it? Feel free to leave a comment and tell me all about it if you so wish.